If you have a special event coming up or a party then why not consider hiring a bouncy castle to make your special occasion more interesting and fun? With so many castles to choose from, you can guarantee to keep anyone happy, especially the grown ups, as we even hire out some of our castles for adult parties. If the weather isn’t too good, then it is possible for you to have a bouncy castle inside your venue if it is big enough. At Bizzy Bouncers we have a wide selection of Castles for all age groups from tots to adults. Sizes range from 8ft x 10ft to 16ft x 18ft (please see pictures for all castles and sizes) click on the thumbnail for a larger view. 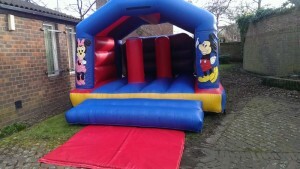 You can have a themed castle if your child is into Disney princesses or we have bouncy castles suitable for boys too. With our 12ft x 14ft pink and blue castles, we can also add to the columns either Peppa Pig, Ben 10, Micky or Minnie Mouse and Toy Story or these can be left blank. The choice is entirely up to you. You can also try our children’s ball pit with any of our castles if you have some toddlers coming to your event or you can just have it on its own. All our bouncy castles are made to the highest safety standards and are inspected regularly. The price includes us delivering your chosen inflatables to you on your desired day, setting up and then dismantling before we take it away. Our bouncy castles are available in a variety of sizes, so here at Bizzy Bouncers we can provide you with all the information and advice that you need to choose the best bouncy castle that fits within your venue perfectly. We know you don’t want something that is too large or too small for your proposed space. Whether you are looking to arrange a large corporate event or a party and would like to hire our equipment then we are happy to help. We have everything you need to make your function a fun and exciting one.